Three E-Lux 2" Eyepieces - 3-element fully multicoated optical design with a 56° apparent field of view (40mm has 50° ) Comes with 26mm, 32mm and 40mm focal lengths. 2" Barlow Lens - 2x - A Barlow lens doubles the magnifying power of your eyepiece by doubling its effective focal length. The E-Lux 2x Barlow is fully multicoated and gives you a total of six power combinations. 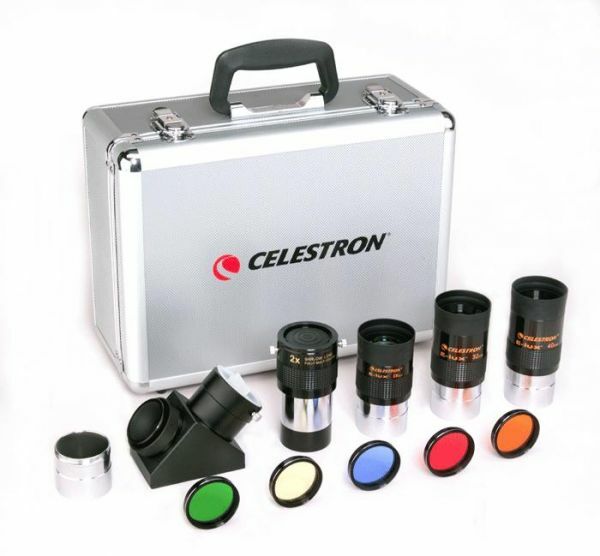 Five Colored Eyepiece (Lunar and Planetary) Filters - 2” - Included are Kodak Wratten #12 (deep yellow), #21 (orange), #25 (red), #58 (green), and #80A (blue). These filters will greatly enhance your enjoyment of our solar system. 2" Mirror Diagonal - This high quality 90-degree multicoated mirror diagonal allows you to take advantage of the wider field of view provided by 2" eyepieces. It fits all rear cells of Schmidt-Cassegrain telescopes and includes an adapter to use with refractor telescopes. Aluminum Carrying Case - This sturdy and well-built case fits all of the above items in the die-cut foam interior.